Originally New St. Pauls, Bridgeville United Church was built as a Presbyterian church in 1894, during a period when the East River Valley was experiencing rapid growth, during the 1890's. The first minister was Rev. James Sinclair. When the iron industry fell, the population declined, and Bridgeville United is now part of the two-piont pastoral charge. 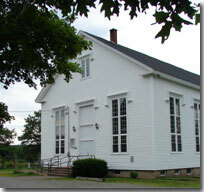 First Presbyterian Church, Hopewell, was dedicated on August 26, 1857, as Union Church. The following year, the first minister, Rev. John McKinnon, was inducted. After the Church union in 1925, the name First Presbyterian Church was adopted. St. Pauls Presbyterian Church is located on the east side of Upper East River, about mid-way between Bridgeville and Sunnybrae. The church was build in 1855 as a congregation of the Kirk, the Church of Scotland. It is design to seat a large congregation. St. Pauls and Sunny Brae alternate at 11am until the "Winter" when Sunny Brae closes and all 11:00 services are at St Paul's until "Spring". During the summer there is only one service at 10am, rotating through all of: Springville, St Paul's, Sunny Brae, and Caledonia. Calvin Presbyterian Church, Sunnybrae, was erected in the year 1854 as a Free Kirk. The first minister was Rev. D. B. Blair. It is now part of the charge that includes Springville, St. Pauls, Sunnybrae and Caledonia. No services at the moment undergoing construction. 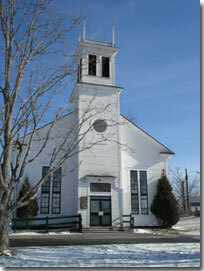 The Church of Springville was built in 1853 and is part of The Presbyterian Church of Nova Scotia. The first minister was Rev. Angus McGillivray. 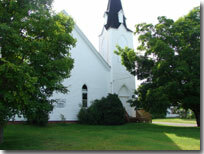 St. Columba United Church, Hopewell, was built in 1859 as a Church of Scotland. The first minister was Rev. Donald McRae. In 1907, St. Columba, Kirk, joined the Presbyterian Church in Canada. In 1925 it decided on a union and it became St. Columba United Church and is now included in the pastoral charge that covers two of the churches in the East River Valley. 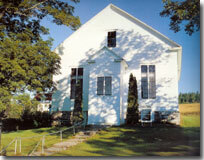 THE SUNNYBRAE UNITED CHURCH IS NOW PRIVATELY OWNED. 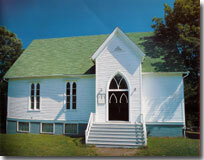 The Sunnybrae United Church was dedicated on October 21, 1951. Rev. George Christie was the first minister. 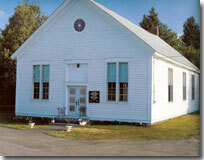 The Church services were held in Rieds Hall and the I. O. O. F. Hall until the church was built, which was accomplished with considerable volunteer work. The United Churches of Sunnybrae, Bridgeville, Hopewell and Eureka are all included in one pastoral charge. 2394 East River West Side Road, Sunnybrae. THE WESLEY CHURCH IS NOW PRIVATELY OWNED. The Wesley United Church in Eureka was built in 1893 as a Methodist church. After the church union in 1925, the Methodist congregation continued to worship with Zion Presbyterian Church until a United Church congregation formed in Eureka. The church was completely renovated in 1973. Over a century ago, Bridgeville was also a thriving community because of the iron industry and because there was a larger population they had their own church. All that is left of this church today is the memorial. The church was built around 1892 and was demolished in 1920. There are approximately 20 to 30 people buried in the cemetery. 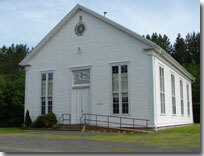 The Zion Presbyterian Church in Eureka was dedicated on November 28, 1893. The first minister was Rev. Alex Laird. Before the church was built the congregation gathered at the St. Columba in Hopewell. The church cost $3 800 and can seat about 400. It was built large because in 1892 the population was very, very large in Eureka. But after the steel industry failed, Eureka experienced a large out migration. Also with the other pressures that arose , the church was put under a lot of stress and the congregation number were ever-shrinking. 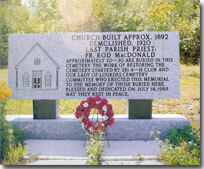 Finally in 1992 the church was demolished.